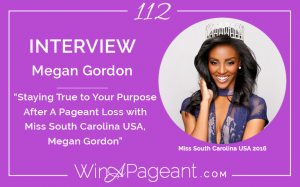 In this episode, Alycia interviews Megan Gordon, Miss South Carolina USA. Megan, a native of North Augusta, SC, is a 23 year old recent college graduate from Armstrong State University where she’s earned her Bachelor’s degree in Nursing. In her spare time, Megan loves trying new foods, traveling, meeting new people and spending quality time with her loved ones.